Living and growing older in community is gaining popularity for many important reasons. The alternative, living alone is expensive and more taxing on the environment (as compared to living in community and sharing resources). The resources that older adults need (or will need), like Meals on Wheels, are scarce or poorly funded. Loneliness and isolation is just as harmful as smoking 15 cigarettes a day. There is a revolution taking place and it’s proving to be a solution to our ever-looming challenge of housing adults 55 and older. This revolution, senior cohousing, is a movement to not only live in community, but to be proactive about one’s future, living in a place that is supportive. No matter how young you are, now is the time to take an active role in your aging process. That sounds great, right? It might even inspire you to pick up a copy of The Senior Cohousing Handbook: A Community Approach to Independent Living, but what happens next? How do we move from dream to reality? Talking about solutions is futile if there is no action. Not walking-the-talk leads to frustration and, in many cases, wasted time and money. Action is needed and that is why McCamant & Durrett Architects and Quimper Village are joining forces to host a weekend intensive workshop on June 15, 16, and 17 on Bainbridge Island, WA. 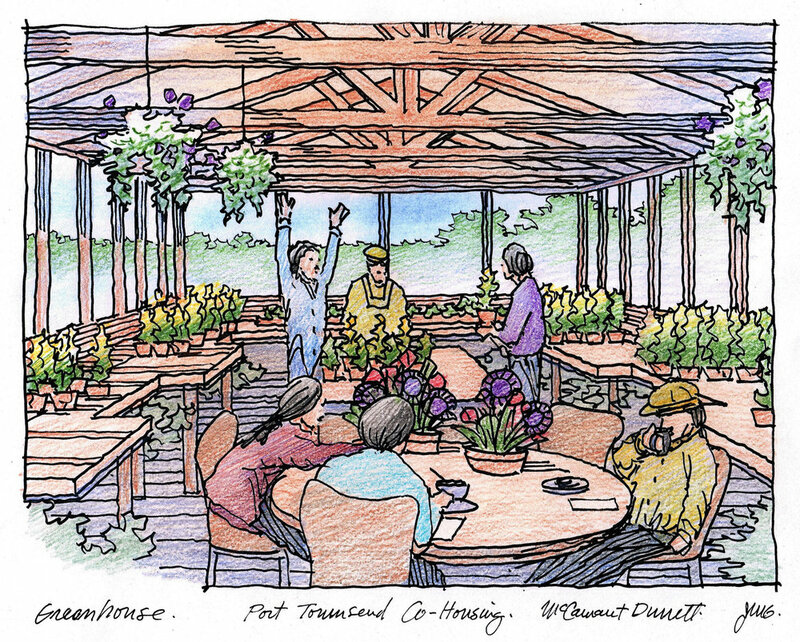 Over three days, participants will spend time with cohousing expert Charles “Chuck” Durrett (McCamant & Durrett Architects) and the residents of Quimper Village, a Senior Cohousing group in Port Townsend, WA, learning how the Quimper Village Group made their project happen. In a small, intimate setting Quimper Villagers will discuss with participants what they did, how they did it, and lessons learned. Time will be spent talking about the financial, legal, and social considerations, plus how groups can market their project where they live. Those who attend will tour Quimper Village, meet the residents, and join them for common lunch. What makes this different from other cohousing conferences? Cohousing Conferences are great for people to get a taste of what cohousing is. They offer perspectives across the board from people who are living in cohousing to those who are new to the concept. The feedback we hear from people who attend is that the information provided at the conferences is inspiring, but for those who already know about cohousing, it doesn’t get deep enough. Others are overwhelmed with theory and not enough action. Those interested aren’t getting the tools they need to actualize their projects. We’ve listened to your concerns and have designed the June Weekend Intensive to respond to them. This is your opportunity to share your project with others — challenges, insights, and more — and get your questions answered by those who have successfully gone through the process of creating their own Senior Cohousing Community. Along with members of Quimper Village, Chuck will walk through how they would get cohousing in your town, if they were living there. Every voice will be heard, and all scenarios considered. Concerned that you’re not old enough? The benefits of Senior Cohousing are best felt by those who live there and are part of it. By moving into a senior cohousing community before you need real assistance, you give yourself time to ease into it, to create bonds, to plan ahead with others. You are more willing to help your neighbor than a stranger, right? In cohousing, you have several neighbors each contributing the health of their community. Why would you want to wait for this when you can have it now? The Senior Cohousing Weekend Intensive is open to 20 people who are ready to get their senior cohousing project going. If you have been thinking about starting your own senior cohousing, if you are looking for a site, or if you have a small group of interested people who are talking about living in a supportive neighborhood where you have a balance of private and community, then this is for you! “I’m amazed at how people help each other out with immediate needs and take on tasks that they see need be done without being asked first. Although there are differences of opinion, it’s not acrimonious. We’re learning how to make it work,” says Pat Hundhausen, resident of Quimper Village, as she talks about how she is settling into cohousing. Pat helped to make Quimper Village a reality and will be one of the key moderators during the June event. Finally, an opportunity to talk about solutions! The chance to work directly with cohousing experts and with cohousing residents on your project doesn’t happen every day. Think about your future, a future that’s more supportive, more economical, more environmentally-friendly, and more fun. Sign up for the Senior Cohousing Weekend Intensive before April 28 to take advantage of the Early Bird Discount! A new look at getting older: Inspiring adults 55+ to support one another and the positive impact it has on housing and livelihood. The last nails are being hammered in. Fresh paint still clings to the damp air. In Port Townsend, Washington, residents of the newly-built Quimper Village Senior Cohousing eagerly await moving into the neighborhood that they co-designed. The neighborhood that not only symbolizes their desire to take an active role in their aging scenario, but also their commitment to supporting, listening to, and living in community with each other. Communities like Quimper Village are cropping up around the world as older adults are discovering the value of taking control of their lives. Socially, financially, and environmentally it makes sense to live near people who care about you, but until you can work with others to create this scenario, it is just a good idea and nothing else. Senior cohousing communities, and groups inspired by cohousing, grow from that need to move things forward into a collective of organized and forward-thinking activists. The result far exceeds expectations, in many cases. Oakcreek Community Senior Cohousing in Stillwater, OK is a good example of a neighborhood where people spend more time on their front porch talking with their neighbors than in their private home. It happens naturally, because the group works together to design their community based on the values they create as a team. Being organized is being in control. While senior living facilities are taking steps to support their residents more than ever before, they still cannot offer what senior cohousing groups can. One way to begin this process is by taking Study Group 1, or SG1, (discussed below and in Chapter 7 of The Senior Cohousing Handbook: A Community Approach to Independent Living ). Participants recognize that they actually have a lot of say in their aging scenario and only in community can they express what they want in a proactive way. In SG1, facilitators take groups through various aspects of their “getting older” scenarios. In a period of 10 weeks, the group discusses how they, as a consortium, can be the solution, planning for their years ahead so when the time comes, they are supported by people they know and trust. After SG1, senior cohousing groups go through a series of workshops which develop cohesiveness and clarity within, along with setting expectations and later co-designing the community of their dreams. It is important to note at this point that none of this can happen without the group being on the same page and out of denial. Cohousing communities aren’t created by one visionary, but by many who share in the vision and, through consensus and being prepared, can decide what is best for all. Senior cohousing communities like Quimper Village are being built across the U.S. The U.K., Europe, and Canada have also seen an upsurge in cohousing groups coming together, and other countries are not far behind. The concept originated in Denmark in the latter part of the 20th century as older adults began voicing their desire to live independently, in community. In the 1980s, Charles Durrett (Principal Architect, McCamant & Durrett Architects) and Kathryn McCamant (CoHousing Solutions) coined the name “cohousing” and popularized it in the U.S. with their book, Cohousing: A Contemporary Approach to Housing Ourselves. Durrett later authored The Senior Cohousing Handbook: A Community Approach to Independent Living, a book that is used by many senior cohousing communities around the world, including those in Denmark. He has since designed about a dozen 55+ cohousing communities and has consulted on many more. 7. No shared income and community is not a source of income for members. From the outside, senior cohousing has many different shapes. Some are suburban while others are in high-density cities. For example, Oakcreek Cohousing in Stillwater, Oklahoma consists of 24 private homes on 7.5 acres, whereas Mountain View Cohousing, in Mountain View, California has 19 units on 0.9 acres. Each has unique qualities within the neighborhood, but all adhere to the proven criteria that make up senior cohousing—and for good reason. While “cohousing-like” developments are being erected (developer-designed senior housing with common amenities is a common example,) these projects tend not to work as efficiently as cohousing, from a community standpoint. The cohousing process is one that requires the input of the group from the start. It has been developed over decades and has proven to be effective in creating trust and dependability within the group. This topic has gained a lot of traction lately as more people are preferring community models over single-family homes, which is why it is more important than ever that people know what works and what doesn’t. It is important to clearly define what cohousing is instead of reinventing the wheel if it is to continue to have the same positive results generation after generation. In addition to sticking to principles, successful communities learn from experts who know what they’re doing. Though the product is a community that is co-designed and co-managed by its residents, consulting with experts during the process is also very important. Durrett and McCamant are recognized as the top experts in cohousing, not because they took a weekend course or dabbled in cohousing. They spent over a year studying with the experts in Denmark before they would take a penny from any group. As a result, they can work efficiently and effectively with groups to ensure that nothing is left out. Senior cohousing communities that work with cohousing professionals in all stages of the game result in getting their projects built on budget and on time. Some of the natural results of going through the design process are that seniors learn to work together, to identify and advocate for their needs, and to listen to one another. On several occasions, senior cohousing residents take more active roles in their larger community, once they’ve completed their own senior cohousing projects. Pat Darlington of Oakcreek Cohousing, for example, has taken up a position in the city council. Needless to say, senior cohousing not only takes care of providing homes for older adults, it also inspires senior cohousing members to live life to the fullest. With the number of people over 65 projected to double in the next 20 years, it is more important than ever to think ahead and plan for one’s own aging scenario. In addition, the needs and wants of seniors are changing, and societies across the globe must respond in ways that will support their needs. Working together: what’s in it for me? The phrase, “Pull yourself up by your bootstraps,” rings strong for many, especially in the U.S. From an early age, we are taught to be strong and that independence equals success. While this can be useful in some cases, the more appropriate (or perhaps sustainable) life lesson is to live among those who you care about, those who listen to and learn from, and those who inspire you to be a better person. When creating a cohousing community, no doubt members run into disagreements. Through mediation and consensus-based decision-making (techniques learned early on in the cohousing process,) the result will not only be a community that functions physically but socially as well because neighbors have space to voice their needs and wants without being ridiculed. That’s why being organized from the start is so important. Working together is at the core of senior cohousing. From idea to reality, the process is very involved and requires that everyone is up for thinking like a community. Breaking bread together is at the heart of cohousing. The result of having a community that responds in-line with the values of each individual is success from a macro and micro point-of-view. Residents know they can trust one-another and that their voice is being heard. Furthermore, being included in something bigger increases self-efficacy and inspires each member to live more fully. Many people fear getting older because they equate it with being alone and being rendered useless. In senior cohousing, you have a good balance of social time and privacy. It’s like being in the college dorms again, without the shared bathroom and bad food. Together with your community you have fun, share experiences, plan outings, support each other, and give each other space when needed. Fears can paralyze us or cower us into giving up control, which is why doing Study Group 1: Aging Successfully (SG1) is one of the first steps in getting the community of your dreams built. SG1 began in Denmark with senior cohousing communities recognizing that the barriers to entry often were held in a set of fears about the future. Through the course of 10 weekly sessions, these groups noticed that fears dissipated as people recognized the value of community in aging. Senior cohousing communities who do SG1 are more likely to get their projects done more quickly, with less difficulty than those who didn’t. Quimper Village is a great example of the positive impact that SG1 had on the residents, who are just about to move into the community of their dreams. SG1 facilitators can be found in the U.S., Canada, and in South America, and the world could use more. What does it take to become an SG1 facilitator? McCamant & Durrett Architects invites those interested to attend Aging Successful: Study Group 1 Facilitator webinar, which runs each fall. Participants gain a clear vision for how to conduct Study Group 1 in their local area while getting the opportunity to talk with Durrett in a small group setting. This participatory webinar readies those with the passion to make a difference. The number one reason that senior cohousing has taken off in the U.S. like it has is that people are reading The Senior Cohousing Handbook: A Community Approach to Independent Living. (Durrett) Not only does the book give important information on how to create a senior cohousing community, it showcases inspiring stories of senior cohousing projects being built in Denmark, Canada, and the U.S.
Having the book is beneficial in two big ways. The book provides essentials on senior cohousing so those interested can make educated decisions on whether it is right for them. Having the book sitting out on your coffee table is also an unobtrusive way to tell others about it. How many times have you told your significant other about a great idea only to have them come up with the same idea, based on something they saw in the newspaper or heard from a friend? Sometimes good concepts have to simmer awhile before they are accepted. Once you’ve got the book into the hands of a few keys figures in your area (potential members and city council for example) it’s time to have fun talking with your neighbors and others in your area who, like you, want to age-in-place in a community they know and support. Bring everyone together for an informal meeting where you discuss what your senior neighborhood looks like. Do an SG1 shortly after that. The main point is to keep the momentum high, you’ll find that most people don’t have time to waste. McCamant & Durrett Architects can assist in, finding SG1 facilitators in your area or prepare you to do it yourself. McCamant & Durrett Architects has designed over 50 cohousing communities and the firm continues to be recognized as the leading architecture and design company for affordable and high-functioning cohousing. 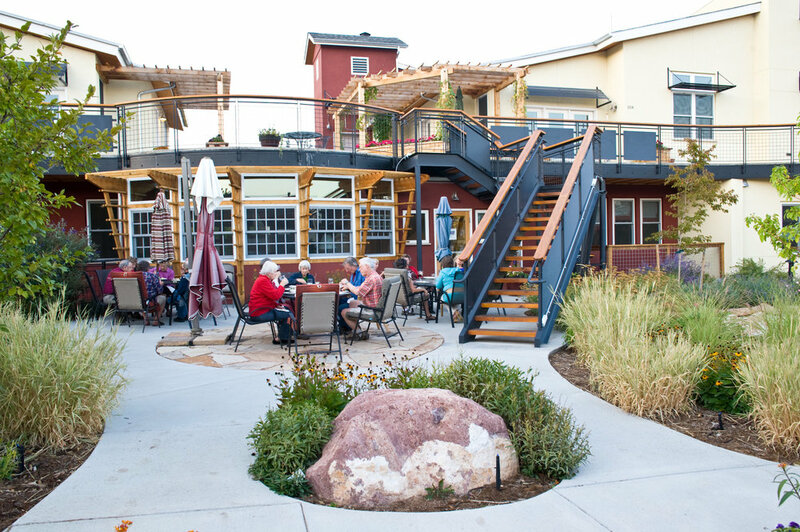 CoHousing Solutions specializes in the development of cohousing communities. The company trains cohousing developers and works directly with cohousing groups. SAGE Cohousing International is a non-profit organization dedicated to informing, coaching, and equipping people and groups who are interested in senior cohousing.